Mr Narendra Modi, the Prime Minister of India has recently been in London, where he addressed both Houses of Parliament. I am glad we were able to put on a good show with the flags which I saw last Friday, a sunny autumnal day. Can you see Churchill? Westminster Abbey? 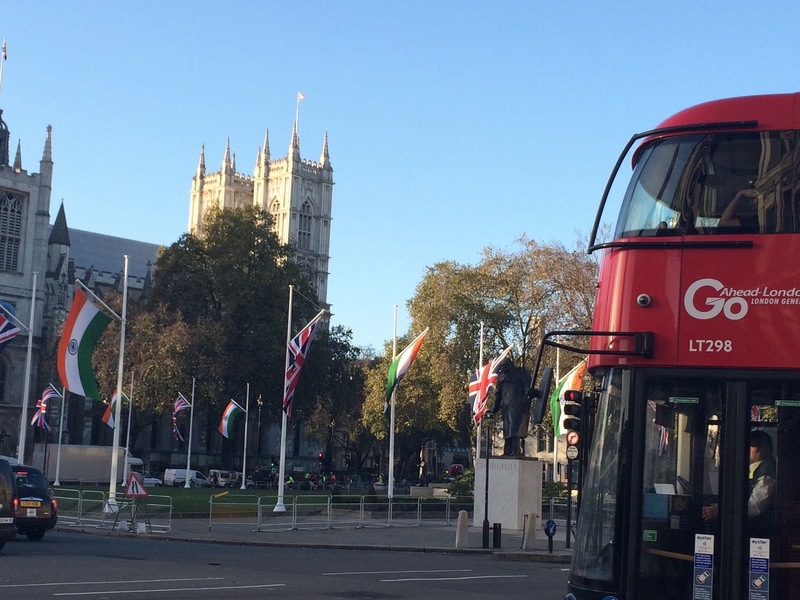 A London taxi and a red bus? I love the Indian flag – not just the splendid colour scheme – white, saffron and a particularly Indian green. Did you know that the Indian flag must be hand woven with handspun cotton, and features a spinning wheel at its centre? You maybe aware that Gandhi’s non-violent struggle against British Imperialism took a number of forms. I remember my father telling me about the Salt March. But the aspect that interested me the most was his approach to cloth, clothes and spinning. I learnt more about this when we visited the Gandhi museum in Mumbai – I would recommend it, if you go there. The flag, by law, must be completely hand made in the rural areas of India. The fabric, known as Khadi cloth, emphasises the idea of self reliance in cloth and clothing was a very important tenet of the Gandhian movement from the 1920s onwards. At mass rallies and protests Indian people were encouraged to set fire to their imported British goods. Cotton grows in India and the raw material was exported to Britain by the British who wove high quality fabrics in factories (my father’s father started such a business in Lancashire at around this time, concentrating initially on ribbons and narrow fabrics). The woven, bleached, dyed or printed fabrics were then imported to India where they were sold at relatively high prices. Gandhi campaigned for people to reject these fabrics and instead rely on making their own yarns and cloth even though the quality was in some senses “inferior” (although everyone likes homespun these days). 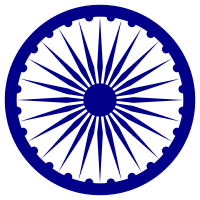 Gandhi encouraged men and women to spin their own cotton and the Ashok Chakra in the centre of the flag is a spinning wheel. 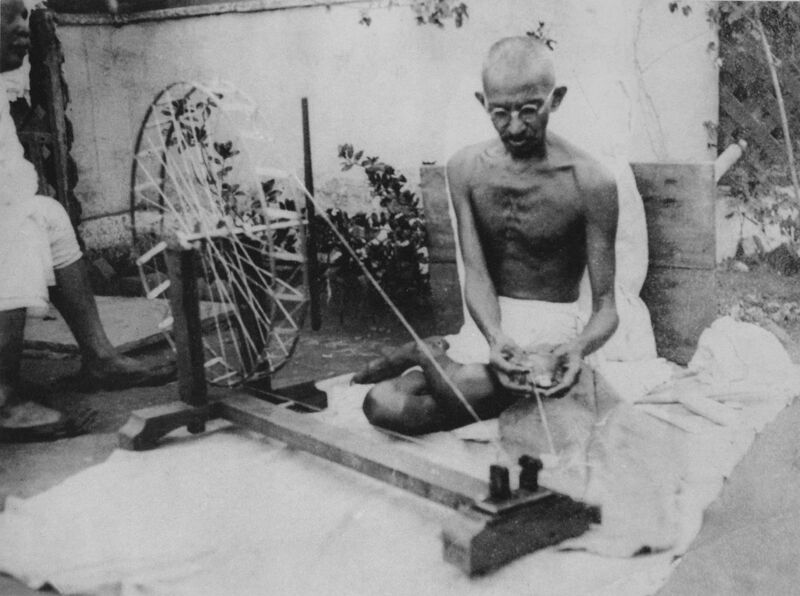 Ghandi not only learned to spin himself; he taught mass rallies to do so (while they listened to political speeches), invented a small portable spinning wheel, and he encouraged all his supporters to spin daily and to weave the Khadi fabric for their own Kurtas (shirts). He wore just a Dhoti wrap, made from Khadi – which certainly caused a stir when he travelled to chilly London for negotiations. Wearing hand made cloth, rejecting factory products, became a sign of nationalistic commitment. Even today these fabrics and garments are prized in India, and often chosen on Independence day in Patriotic colours. I like the simplicity and subtle quality of the Khadi cloth – usually cotton but silk is available too. You can see examples of Kurta cloth at the Fabrics of India exhibition at the moment. There is also a short film about Gandhi which covers the role of textiles in the Independence Movement, covered in this interesting post. The traditional kanga in East Africa is actually Indian cotton. The weave is so fine and the more they are washed the softer they get. I have never found cotton from anywhere else that is so fine. Another interesting post on textiles, we just take so much for granted. Thanks for this informative post. There is so much more than just sewing to fabric. I am still very much looking forward to visiting the V&A for the Fabric of India exhibition. Lets hope there is still someone around to weave it in the future! Thank you Kate. This is very illuminating. Thank you Kate ! I had no idea about this. How interesting ! Hi Karine! I was just thinking about you, not having heard from you for a little while. How are things going? Are you going to do SWAP this year? Very interesting details I did not know, K. Thanks! The colours are lovely.